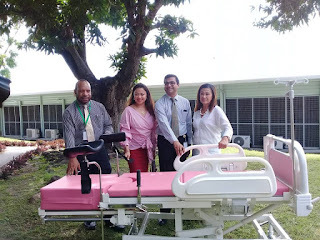 30 standard labour beds were donated today by the Karim Bel organisation, a Chinese charity organisation which has been partnering with the Port Moresby General Hospital. The hospital CEO Dr Umesh Gupta said the labour ward can cater for only 24 beds of which most are run down and has been there for the last 15 to 18 years and the donation is a big relief for the hospital. Meanwhile, the Port Moresby General Hospital now has plans in place to create more labour wards in urban centres to cater for the increasing number of deliveries at the hospital. According to the CEO, they are delivering about 45-50 babies a day but they only have a 24 bed labour ward and an extra six for the emergency cannot cater for all. Moreover, Monica Seddon a representative from the Karim Bel charity said the organisation has been working in partnership with the hospital for more than 10 years now. ‘’Karim Bel Charity is an organisation comprised of 5 Chinese Women who just have the heart to help other women’’, she said.